Little Fashionistas Closet: Archive: Honor's Outfits - Bonpoint, GAP, Ralph Lauren and more! Archive: Honor's Outfits - Bonpoint, GAP, Ralph Lauren and more! Honor Warren wore this Beige Fair Isle Dress by Ralph Lauren Children, to attend a wedding with her parents in Claremont, CA on January 6, 2011. Honor wore Purple Velveteen Ruffle Jacket from Gosford Park FW'09 line and Grey Skinny Jeans, both from GAP and White Converse Shoes; while out for brunch with her parents in LA on January 9, 2011. Honor wore Purple Swirl Print Dress and Grey Leggings both from Sun Valley FW'10 by GAP and Pink Authentic Core Shoes by Vans of The Wall; while out for lunch in West Hollywood, CA on January 14, 2011. Honor wore Grey Cable Knit Shrug from Denim Looks FW'10 and Purple Ruffle Tutu Skirt from Pop Shop FW'10, both by GAP. Honor's outfit was completed by Liberty Print Soft Headband SS'10 by Bonpoint and White Converse Shoes; while running errands with her mom in Beverly Hills, CA on January 16, 2011. Honor Warren wore this Grey Plaid Dress by Bonpoint, while out with he mommy - Jessica Alba in Beverly Hills, CA on January 19, 2011. Honor wore Alpaca Heart Pocket Dress by Oeuf and White Converse Shoes, while out on the playground in Beverly Hills, CA on January 22, 2011.
such a good job! !..you shd sideline with Honor's fashion as well! Little Fashionista's Closet is all about pretty outfits for your little princess! Luna Luna Copenhagen 60 OFF SALE @hautelook! 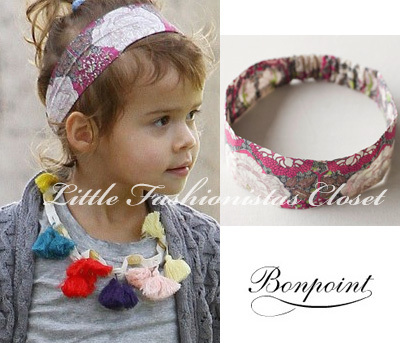 Satyana in GAP & Bonpoint! Nahla in Little Paul and Joe! Grace attending NYFW in Milly Minis! Honor in EGG & Vans! GAP wants to Hear YOU! Month of Kids SALEs on Hautelook!